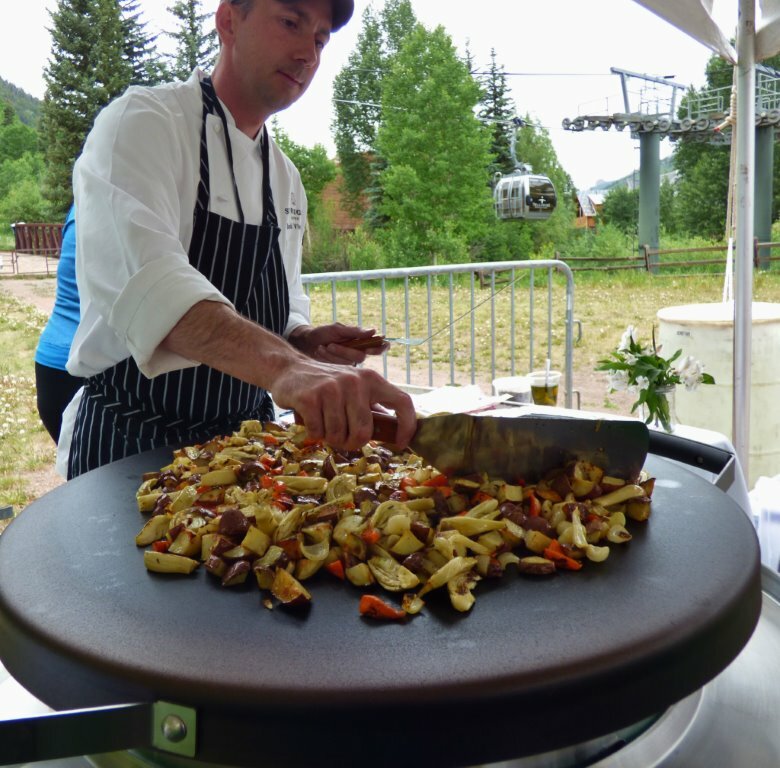 The EVO grilling area and Rose garden at the Telluride Wine Festival was set up underneath the gondola in the center of town. It was a truly great place to be last weekend. What an amazing location to hold a wine festival! The sheer beauty of Telluride, Co is difficult to accurately capture in words or pictures. But it was sure easy to enjoy. 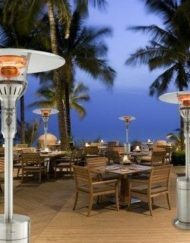 Especially with a glass of fine wine in hand and world class porterhouse being prepared and carved alfresco in front of you. Chef David Viviano of the St. Regis Aspen was the talent behind this rustic simply delicious dish. 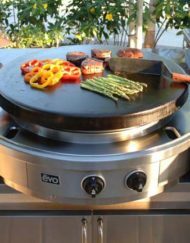 He even shared his recipe with us, so you could recreate it at home (especially if you’re lucky enough to have an EVO grill like Chef Viviano used). 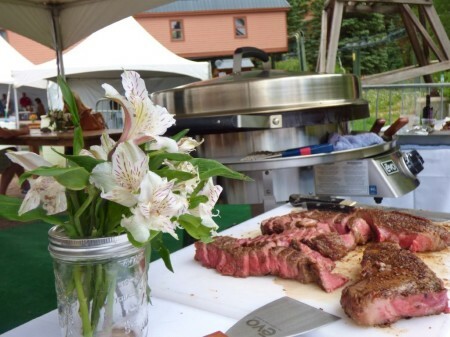 He served his steak alongside a mix of caramelized vegetables, which he cooked on the EVO then held covered while the steaks cooked. 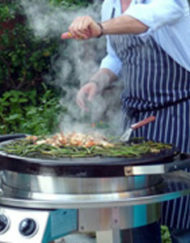 Chef Viviano finishes the vegetables cooked in foil directly on EVO. The vegetable mix included 1 lb new potatoes, 1/2 lb fennel sliced in wedges,1/2 lb baby carrots,1/2 lb cippolini onions, 1 t fresh thyme and 1 t olive oil with salt and pepper to taste. The mix was wrapped in 2 layers of foil to cook in center of EVO for 30 minutes then placed directly onto EVO to finish caramelizing. The fennel was the stand out in the dish. It was interesting and unique, which tasters enjoyed but had difficulty placing. 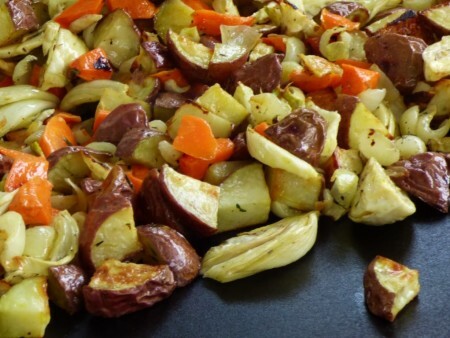 Feel free to use the mix of vegetables that are fresh and available when you prepare this, but we encourage you to give fennel a shot. 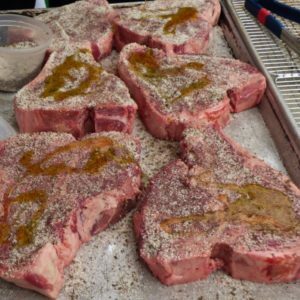 Porterhouses rubbed down with herbed salt and oil are ready to place on grill. The centerpiece of the plate was an Italian style porterhouse – Bistecca Fiorentina-which was given a liberal rub of Chef Viviano’s herbed salt mix. Then he drizzled the steaks with some oil and put them into the EVO set to High for optimum sear. After searing both sides, he lowered the temperature and covered to let the meat finish cooking. How long will depend on the thickness of your steaks. Finally he removed the lid and checked meat firmness with his finger for a perfect medium rare. A meat thermometer may prove helpful for the home cook here. 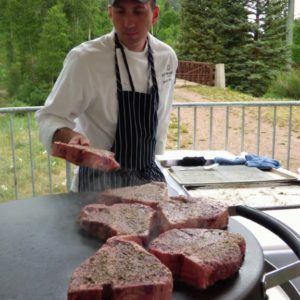 Medium rare will be 130-140F and Medium will be at 140-150 F.
Chef Viviano carves the perfectly seared steaks for the crowd to sample. The steaks rested for several minutes to let the juices redistribute. 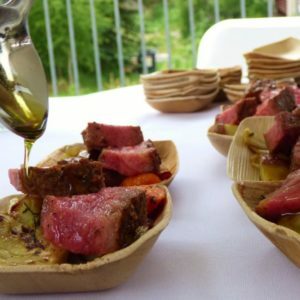 After trimming and slicing, the meat was served alongside the vegetables with a drizzle of olive oil, good balsamic vinegar, and a sprinkle of sea salt. 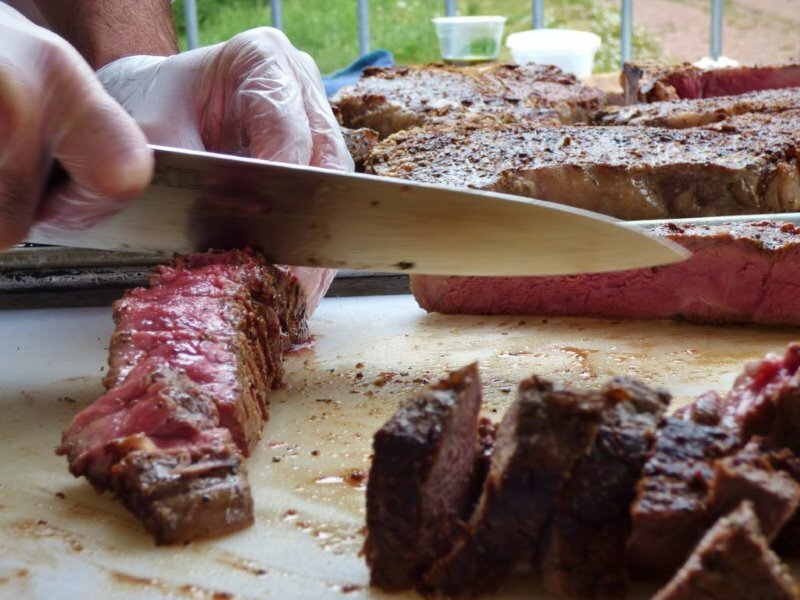 Perfectly cooked steaks ready for the finishing touches. 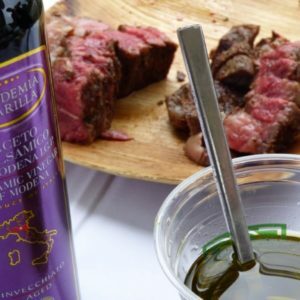 Chef Viviano has a Sicilian heritage, which comes out when he selects olive oil,balsamic vinegar, and sea salt to finish his poterhouses. Perfect crowd pleasing food. This menu is certain to impress dinner guests at your house. And if you trim and slice it like we did here, one steak serves several guests. Add a fresh baby arugula salad topped with heirloom tomatoes and dressed with that same good olive oil and balsamic vinegar and a loaf of good bread. You have a simple Italian rustic feast. Don’t forget to add a bottle of Super Tuscan red wine and San Pellegrino. A perfect pairing. Much like the beauty of Telluride and a wine festival- even better together. Many thanks to our guest chef David Vivianno for his time and talent! The guests of the St. Regis Aspen are a lucky crew. I NEED to try this. Have you used this with seafood? Yes, we use the marinade and serving ideas with both local SC shrimp(larger size work best) and thicker fish like Salmon.